Erie County wants SolarCity and another developer to build two of the biggest solar arrays in the Buffalo Niagara region on vacant county-owned land near the Alden Correctional Facility and near the county’s wastewater-treatment plant in Angola. The proposed solar arrays would have the capacity to generate as much as 6 megawatts of electricity and could save Erie County an estimated $9.5 million over a 20-year period, according to an analysis by a consultant hired by the county. The combined generating capacity of the two arrays would be eight times bigger than the capacity of the solar array that was installed on the University at Buffalo’s North Campus in Amherst. That array has the capacity to generate 750 kilowatts of electricity. The projects, which would involve SolarCity and Greenskies Renewable Energy, would use vacant county land to create a new source of renewable energy that could be used to reduce energy costs associated with major county buildings. Under the arrangement, which is similar to deals that SolarCity has crafted with the Onondaga County government to build solar arrays near major county installations, the solar energy systems installer and its partner would own and operate the solar array. Because SolarCity and Greenskies will be able to claim lucrative incentives aimed at encouraging the adoption of solar energy, including a federal tax credit equal to 30 percent of the project’s costs, Erie County is expected to be able to purchase the electricity generated by the solar arrays at a fixed rate that is less than the retail rate charged by local utilities National Grid and New York State Electric & Gas Corp. The projects also could seek additional incentives from the state’s NY-Sun program. The proposal envisions the construction of two separate solar arrays. SolarCity would build a 4-megawatt array to the east of the Big Sister Creek Wastewater Treatment Plant in Angola, within National Grid’s service territory. A second, 2-megawatt array would be built by Greenskies, a Connecticut-based solar power developer, to the west of the Alden Correctional Facility, located within NYSEG’s service territory. Together, the two arrays would generate enough electricity to provide power for about 1,000 homes, according to data from the Solar Energy Industries Association. The county’s consultant, Fluent Energy, said the $9.5 million in projected savings from the project could vary, depending on the final design and size of each array, although it characterized its cost estimate as conservative. The solar projects stem from the county’s move last year to seek proposals from companies interested in building solar arrays on county-owned land. The county received eight proposals, with SolarCity and Greenskies being selected for the projects. Long-term contracts to purchase power, such as the 20-year deal planned for the Alden and Angola arrays, generally have been the preferred option for most large installations, especially municipal projects, because the arrangements don’t require any money upfront and typically provide immediate cost savings. While Fiegl said the county hopes to have the arrays in place by the end of this year, the project still has several hurdles to clear. 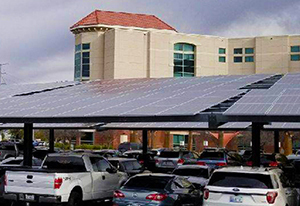 The County Legislature has voted to endorse the solar project, but before it can proceed, the Legislature must approve a local law allowing the county to lease the property for a period of more than five years. The Legislature held a hearing on that proposed legislation Tuesday, but it can’t vote on the local law until Feb. 4 at the earliest. If the local law is approved, contracts then must be worked out with the two developers, and design work on the arrays must be approved. The solar projects are a way for the county to promote the development of clean energy in a fiscally responsible way that also reduces the harmful greenhouse gas emissions, associated with electricity generated by fossil fuels such as coal and natural gas, said Lynda H. Schneekloth, chairwoman of the Sierra Club Niagara Group. Erie County Executive Mark C. Poloncarz said the solar projects are part of efforts to find more efficient ways of generating and providing energy for county buildings at a lower cost. “These power purchase agreements take our commitment to the next level,” he said. A total of 1,278 solar arrays have been installed in Erie County or have received approval for installation, according to data compiled by the New York State Energy Research and Development Authority. Governments across New York are aggressively turning to solar as a way to reduce their energy costs, and also help the state meet its ambitious goals of getting half of its electricity from renewable sources by 2030. In Onondaga County, for instance, solar installations that SolarCity is building near two wastewater-treatment plants and two other county facilities are expected to provide about 10 percent of the electricity consumed by the county government. In all, those Onondaga County arrays will have more than 9 megawatts of generating capacity, about 50 percent more than the capacity of the two proposed Erie County arrays. A Long Island array, the 32-megawatt Long Island Solar Farm located at the Brookhaven National Laboratory in Suffolk County, is the largest solar photovoltaic power plant in the eastern United States.